We’d love your help. Let us know what’s wrong with this preview of Robert E. Lee in War and Peace by Donald A. Hopkins. Robert E. Lee is well known as a Confederate general and as an educator later in life, but most people are exposed to the same handful of images of one of America s most famous sons. It has been almost seven decades since anyone has attempted a serious study of Lee in photographs, and with Don Hopkins s painstakingly researched and lavishly illustrated Robert E. Lee in War Robert E. Lee is well known as a Confederate general and as an educator later in life, but most people are exposed to the same handful of images of one of America s most famous sons. It has been almost seven decades since anyone has attempted a serious study of Lee in photographs, and with Don Hopkins s painstakingly researched and lavishly illustrated Robert E. Lee in War and Peace, the wait is finally over. Dr. Hopkins, a Mississippi surgeon and lifelong student of the Civil War and Southern history with a recent interest in Robert E. Lee s from life photographs, scoured manuscript repositories and private collections across the country to locate every known Lee image (61 in all) in existence today. The detailed text accompanying these images provides a sweeping history of Lee s life and a compelling discussion of antique photography, with biographical sketches of all of Lee s known photographers. The importance of information within the photographer s imprint or backmark is emphasized throughout the book. Hopkins offers a substantial amount of previously unknown information about these images, how each came to be, and the mistakes in fact and attribution other authors and writers have made describing photographs of Lee to the reading public. Many of the images in this book are being published for the first time. In addition to a few rare photographs and formats that were uncovered during the research phase of Robert E. Lee in War and Peace, the author offers for the first time definitive and conclusive attribution of the identity of the photographer of the well-known Lee in the field images, and reproduces a startling imperial-size photograph of Lee made by Alexander Gardner of Washington, D.C.
Students of American history in general and the Civil War in particular, as well as collectors and dealers who deal with Civil War era photography, will find Hopkins s outstanding Robert E. Lee in War and Peace a true contribution to the growing literature on the Civil War. To ask other readers questions about Robert E. Lee in War and Peace, please sign up. Has everyone who has read this book posted a review on Amazon and copied it to the Barnes and Noble website? It is very important for independent publishing. 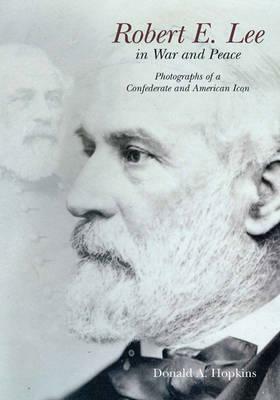 This book documents the currently known photographs of Robert E. Lee, along with the time and location of their production. Along the way, it provides information on the early history of photography and the pioneers of the profession. A great reference and read for anyone interested in Robert E. Lee. Review will be posted here after it posts at its place of origin.